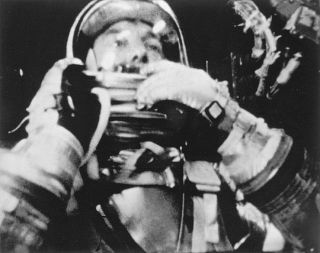 Alan Shepard became the first American to reach space when he launched on a suborbital flight on May 5, 1961. Shepard narrowly missed out on being the first human in space -- Soviet cosmonaut Yuri Gagarin beat him to the punch about three weeks earlier, successfully completing one orbit of Earth on April 12. How high did Alan Shepard fly? Shepard's achievement was much more modest than that of Gagarin, who reached Earth orbit and stayed aloft for 108 minutes. The U.S. wouldn't duplicate Gagarin's feat for nearly a year, until John Glenn's orbital flight in February 1962. How big was Shepard's Freedom 7 spaceship? Shepard was packed pretty tightly into the one-man Freedom 7 capsule, which measured 11.5 feet (3.5 meters) tall and was just 6.2 feet (1.9 m) across at its widest point. By contrast, Gagarin's Vostok 1 capsule was about 14.4 feet (4.4 m) high. Still, the astronaut managed to make out some landmarks on terra firma during his flight. He spotted Florida's Lake Okeechobee, as well as some islands in the Bahamas, according to NASA officials. A Redstone booster lofted the Freedom 7 to suborbital space. When NASA initiated orbital flights in 1962, the agency employed more powerful Atlas rockets, which had originally been designed to carry nuclear bombs. Did Shepard actually fly the Freedom 7, or was he just human cargo? Gagarin's flight was largely automated, so the cosmonaut didn't have to do much during his orbital sojourn. But Shepard played a more active role on his maiden spaceflight, taking control of the Freedom 7 for several brief periods. For example, Shepard manually positioned the capsule to fire its retrorockets, which helped the craft decelerate. He also corrected a slight pitch problem in one instance, and he steered the craft by hand for a spell during re-entry, according to NASA officials. Could Shepard have beaten Gagarin to space? Historians say Shepard's flight likely could have occurred before April 12, 1961, if NASA and chief rocket designer Wernher von Braun had been a little less cautious. On Dec. 19, 1960, NASA launched an unmanned Mercury capsule atop a Redstone booster into suborbital space for the first time. That test flight was a success, so the agency soon ramped up to a "semi-manned" test, launching a chimp named Ham into suborbital space on Jan. 31, 1961. Though Ham came through his space jaunt unscathed, some problems with the Redstone emerged during the flight. This concerned NASA and von Braun, especially since a Redstone test flight in November 1960 had failed, getting only 4 inches (10 centimeters) off the pad. The extra test flight was intended to make sure NASA had worked out all the Redstone's kinks before risking Shepard's life. But the delay opened a window of opportunity for the Soviets, and they leapt through it, launching Gagarin on April 12. Shepard himself seemed to think NASA's caution was unwarranted, or at least unfortunate. "We had 'em," Shepard is reported to have said at the time, referring to the Soviets. "We had 'em by the short hairs, and we gave it away." Did it matter that Gagarin was first? Gagarin's flight was the second major victory for the Soviet Union in its Cold War space race with the U.S. The first was the surprise launch of Sputnik I, the world's first articial satellite, in October 1957. While Gagarin and Sputnik bruised American pride, they spurred the nation's space program to new heights. Without those twin shocks, historians say, the Apollo program – an all-out rush to the moon designed to firmly establish American space supremacy – would likely never have been possible. "A lot of these factors had to line up -- Sputnik, Gagarin, all this stuff," space historian Asif Siddiqi of Fordham University, told SPACE.com last month. "That kind of crash mentality is not there anymore, because we haven't had that kind of a shock since then."